738611999 – TExES Core Subjects EC-6 (291) (TExES Teacher Certification Test Prep) by Dr. Luis A. Rosado Ed.D. 738611999 –REA’s TExES Core Subjects EC-6 (291) Test Prep Gets You Certified and in the Classroom! The Core Subjects (291) test was launched in January 2015; it replaced the TExES Generalist (191) test. Whether you are a traditional college student or a career-changing professional, REA’s TExES Core Subjects EC-6 (291) prep is designed to help you pass the test so you can get certified and start your teaching career. Written by a team of noted teaching experts led by award-winning Texas-based author Dr. Luis Rosado, this test prep is relevant, up-to-date, and practical. This is focused prep custom-built for the TExES Core Subjects exam EC-6. It’s for candidates who want all their prep conveniently packaged in a printed book. The book contains five targeted subject reviews that align with each Core Subjects subtest and one full-length practice test featuring over 250 questions and detailed explanations that cover every domain and competency. 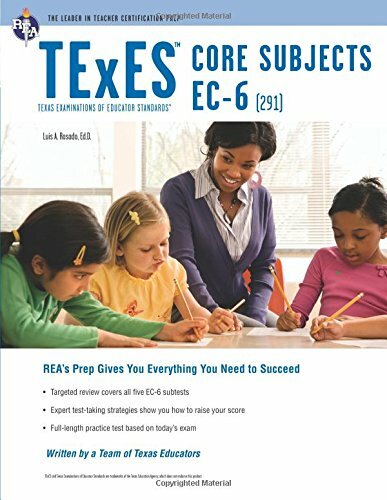 REA’s TExES Subjects EC-6 (291) test prep is a must-have for anyone who wants to teach early childhood and elementary school. Author: Dr. Luis A. Rosado Ed.D.